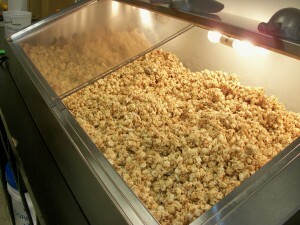 Popcorn – It is a type of corn which explodes from the kernel and puffs when heated. It was originally discovered by Native Americans. It became popular as a snack in the U.S. during the Great Depression. The corn pops because the kernels have a hard moisture-sealed hull and a dense starchy filling. This allows the pressure to build inside the kernel until it pops. This is one of those posts that is so easy to talk about. The subject? Popcorn!! Not just any popcorn but Fisher’s. I have sent this popcorn to many places; California, Florida, Colorado, Maryland, New York and Puerto Rico. On Saturday I decided to walk around downtown Rehoboth Beach before all the parking spaces were taken. I saw a familiar face at Fisher’s so we started talking. I asked Corey if I could take some pictures and he graciously agreed. 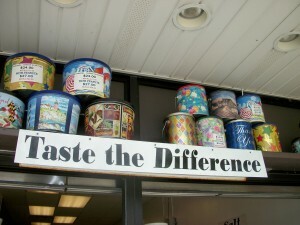 Fisher’s Popcorn has been a family business for over 70 years, all the way from Ocean City, Maryland to Rehoboth Beach. The location I am blogging about is the one right on Rehoboth Avenue. The address is 44 Rehoboth Avenue, Rehoboth Beach, DE 19971. Tel. 302-227-2691. Website is www.fishers-popcorn.com. 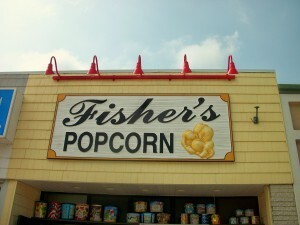 Fisher’s Popcorn arrived in Rehoboth about 4 years ago. They did not need any introduction since anyone that has visited the Maryland and Delaware beaches has eaten Fisher’s and taken some to friends and family back home. Fisher’s makes its popcorn in-house and you can actually see them mixing the caramel corn in a big kettle by hand. When it is ready then it is dumped in the store front display and if you are passing by there is no way you are going to keep on going. Warm but crispy, sweet but not overly so, nice edible chunks…the best. I kid you not!! 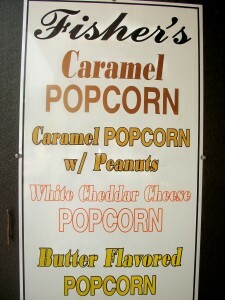 Fisher’s flavors are: caramel, white cheddar, caramel with peanuts and buttered. The all time favorite is the caramel. Even though I stepped inside Fisher’s I will have to tell you that you will not see a recipe anywhere. It is a family well kept secret. 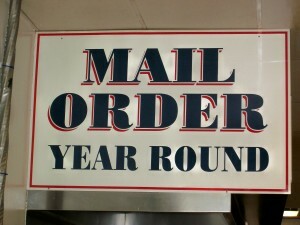 A big part of Fisher’s is their mail order. They do so year-round. 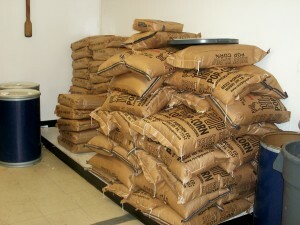 They are also able to send their popcorn to the military. They have all sizes ans styles of containers, so please check their website. So, next time you are in Rehoboth Beach, Bethany Beach, Fenwick Island or Ocean City, Maryland, please stopy by because you will not believe how good it is!! Note: The caramel popcorn at Fisher’s is gluten free. A tip: If you want to eat it warm, just put some of the caramel popcorn in the microwave for not even a minute and it will taste as if you had just bought it. Talk to you later….again, from Boulder, Colorado for a few days…. Information on popcorn was taken from http://en.wikipedia.org. 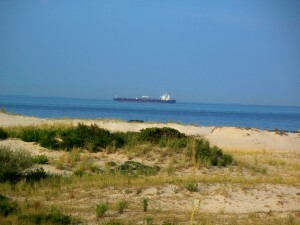 Just the other day I wrote a post about Bethany Beach and what was going on this coming week. I would like to let you know, at this time, that a building lot auction will be taking place, at 313 Parkwood St., at 11:00 a.m., on Saturday, on site, rain or shine. I know Bethany because for 19 years I lived in this community. It was the best place to bring up my children. It is a family town. Garfield Parkway is lined up with restaurants, shops, and flowers and at the end is the Boardwalk and the beach. On Saturday, July 3rd, there will be an auction in this town. The Bethany Beach Building Lot is on 313 Parkwood Street. It is 40′ x 125′; located on a dead end street. 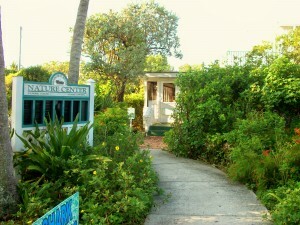 It is also 2 1/2 blocks from the beach, across Rt. 1, and 3 blocks from the center of Town. Worthy of notice is that this lot is not in a flood zone and that all City services are available. The auction will be handled by Richard L. Bryan. The sale is in conjuction with Tidewater Realty, located in Bethany Beach. The seller is a Licensed Delaware Real Estate Broker. 10% Deposit required at time of sale. Balance in full in 30 days. Sale is subject to immediate owner confirmation. For further information, please contact Mr. John Merryman at Tidewater Realty, telephones 302-245-5900 or 302-539-7500, and Mr. Richard Bryan, at 302-645-4800. Mr. Richard L. Bryan has been a realtor since 1982. He is a Licensed Delaware Real Estate Broker. He attended Nashville Auction School. Good luck and talk to you later….as usual…. I was in the mood for some comfort food. 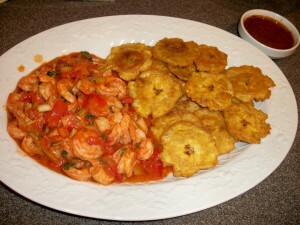 I think if you ask anyone from Puerto Rico they will probably tell you that they consider “tostones” their comfort food. Off to Giant, our local supermaket, I went and they did have plantains. I needed them green for the “tostones”. I don’t think there is a translation for “tostones”. 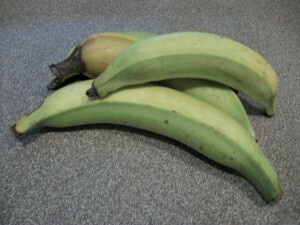 Plantains are from the same family as the bananas. They are a starch and they do have less sugar than the bananas. 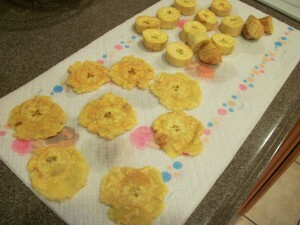 The easiest way to peel the plantains is by cutting the tips on each end. Then, place the plantains in the microwave for 1 minute. Make a slice with a knife, lengthwise, just on the skin and peel it back. 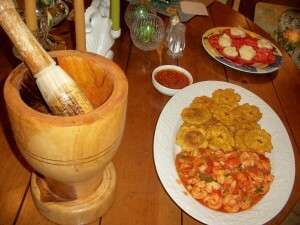 Cut the plantains in one inch chunks and place them in a bowl of water with a teaspoon of salt. 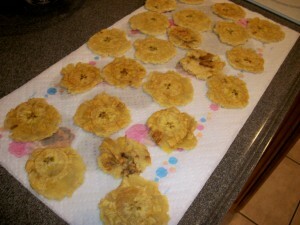 I like my “tostones” thin so that’s why I gave you that measurement. 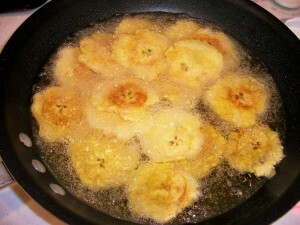 Drain the plantains and in a deep fryer or deep frying pan put enough Canola oil to submerge the plantain chunks. Fry them until they are golden. Place them to drain on paper towels. Yes, it is too bad that they need to be fried but I am telling you, that’s why they are so good. The next step is to flaten them. All you need is waxed paper and a plate. Put one chunk at a time in between the wax paper and flaten it with a plate. Continue to do so until all pieces are flatened. Believe it or not, it really does not take long. Back again into the frying pan. Fry them until they reach a very deep golden color. They will rise to the surface of the oil. Drain again on paper towels. Some people just eat them as a side dish and others like them as a snack. Some put just butter on top and a bit of garlic powder and some, like me, make a Mojo. Yes, the Mojo really came before the alcoholic Mojito. It is one of those sauces made in a Pilon (Mortar and Pestle), if you have one. If not, then improvise. Garlic and salt are the first condiments of my Mojo. Then mash with the pestle. Add about 3 tablespoons of olive oil, mixing everything in. Then add a small can of tomato sauce, the juice of a half a lime, cilantro to taste, pepper, and a dash of Tabasco or more. The measurements are not exact, as you can tell by the way I am writing. Some times I think it needs a little more lime, or maybe more cilantro so you will probably have to make this recipe your own. The Mojo is a sauce used for a lot of dishes. I was making some shrimp with onion, peppers, olive oil, a little bit of butter. I just sauteed all the vegies and at the last minute the medium shrimp went in and cooked until nice and pink. I added some of that Mojo to give it a nice sauce. I had gone to Tomato Sunshine and got really pretty tomatoes. 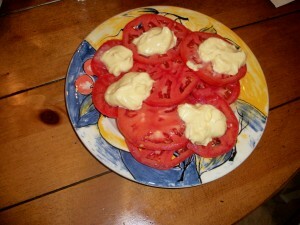 Once summer starts giving us good tomatoes then I love to make mayonnaise. You wonder why? Well, it is homemade and delicious. In a small bowl put mustard, salt and egg yolks. Mix together with a mixer on low speed. Then add oil, 1 tsp. at a time a t first, mixing well after each addition. For the first 1/4 cup be sure to add only a little at a time. As the mixture thickens, thin with 1 tsp. vinegar. Keep mixing with the mixer. After 1/4 cup of oil, you may add the oil a little faster. The first additions of oil make the emulsion. If by any chance it separates during this time, take another egg yolk in another bowl and start over. 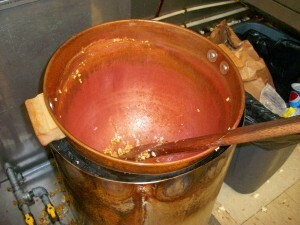 After you get this well started, you can add the old separated mixture to it. I don’t think you will have any problems. When mayonnaise is finished, add a dash of Worcestershire and a dash of Tabasco to taste. Enjoy and make it your own. Talk to you later…..as usual…. 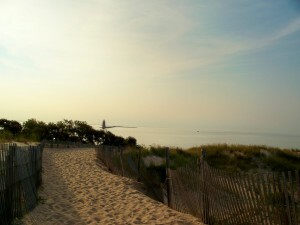 I was taking a walk this morning, here, in Rehoboth Beach, and it was so hot. It reminded me of the same heat I felt in Delray Beach a few weeks ago. We think that there is nothing going on in South Florida this time of the year but I was pleasantly surprised how crowded this Village by the Sea was a few weeks ago. As hot as it was, I did not mind it. Monday, June 28th – Booksigning at Murder on the Beach, a Mystery Book Store, located at 273 NE 2nd Avenue (Pineapple Grove Art District). Tel. 561-279-7790. Website www.murderonthebeach.com. Open Mondays through Saturdasy from 10 a.m. until 6 p.m. Closed on Sundays. Murder on the Beach carries new, used, collectible books, and audio books. They also carry mystery jigsaw puzzles and mystery dinner games. Craig Johnson is a mystery writer from Wyoming and he is the author of The Cold Dish and The Dark Horse. Tuesdays through Saturdays – Coral Reef Shark Feeding at the Sandoway House Nature Center located on 142 S. Ocean Blv., Delray Beach, FL 33483. Tel. 561-274-7263. 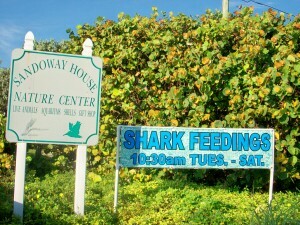 On Sundays the feeding takes place at 1:30 p.m. Website is www.sandowayhouse.com. You know, the Sandoway House is a house that was designed by Samuel Ogren, Sr. in 1936 for early Delray winter resident J.B. Evans who was a retired produce broker. It is a simple home, overlooking the ocean, and it is one of the last remaining Resort Colonial Revival houses in Delray. Since it was built during the Great Depression, the only ostentation is the cathedral window on the south side of the house. 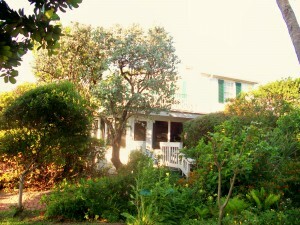 In 1998, this house opened its doors to the public as a nature center in a historical setting. Please visit the website or give them a call because they have all kinds of programs, plus it is a neat house to tour; you don’t find many of those left. They have turtle talks, garden walks, inside and outside talks about shells, fossil Fridays and snake and lizard talk. Boston’s is an institution in Delray Beach. It has been in this town for 28 years and there is always food, fun and live music. Right there a block south from Atlantic and A1A, across from the beach. The address is 40 S. Ocean Blvd. and the telephone is 561-278-3364. The website is www.bostonsonthebeach.com. On Monday, 6/28 is Reggae Night from 9 p.m. until 1:30 a.m.
On Tuesday, 6/29 it is Blue Tuesdays from 8:30 until 9:30 p.m. This night brings world class blues music featuring famous Frank Ward and “The Nantucket Goobers”. It is an ever changing lineup of musicians and special guests. On Friday, 7/2, Saturday, 7/3, and Sunday (the 4th!!) – It is The Red, White & Blues 2010 Festival at Boston’s on the Beach at Atlantic & A1A. Featuring Elvin Bishop & Tinsley Ellis. Admission $12 on Friday, $18 on Saturday or a 2-day pre-sale pass for $20. No charge on Sunday. A portion of the proceeds will benefit the Forgotten Soldiers Outreach. For schedule performances please visit the website above mentioned. Friday, 7/2 – Gallery Walk – 7:00 p.m. until 10:00 p.m. This is a time when Delray’s downtown art galleries and studios open their doors to the public for extended hours for music, art and refreshments. The following businesses I personally know. There is no better way to advertise than by word of mouth. Yes, they are also my advertisers right on my blog. Just click on their individual sites and this will take you into their websites for information on everything they have to offer. Tauriello & Company Real Estate – I have used them many times. 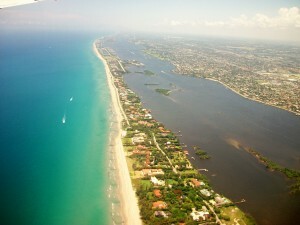 Please call John Merryman at 561-573-8500 in case you want a place in this beautiful Village by the Sea. Anita Jennings Designs – Interiors. You may contact Anita at 561-278-7473. Beach House Management, LLC. – Property Management Company. Tel. 561-376-4329. Please talk to Michael Keegan. I cannot say enough about Michael. I have known him for a very long time and having a house in Delray with him taking care of it, has given me peace of mind. Have a great week!! Enjoy the Second Season…. 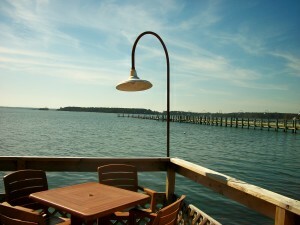 Venus On The Half Shell, Dewey Beach, Restaurant, Review, Delaware Beaches, Again?? 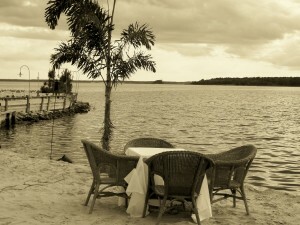 Yes, again I found myself at Venus on the Half Shell located at Dagsworthy Street & the Bay. Tel. 302-227-9292. Website www.deweybeachlife.com. It was not my intention, at first, to visit this restaurant so soon after I had just eaten here a few weeks ago. In a way it turned out to be just as good as the first experience. My first visit was not on a week-end, so I wanted to see how they would handle a much larger crowd. 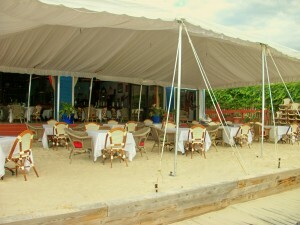 The table was ready; out under the tent, on the sand, and the service was prompt and attentive. My original plan was to eat dinner in Rehoboth with friends, but the thought of looking for parking was not good. My friends had not eaten at Venus under the direction of Chef Peter A. McMahon so our decision was made. It was such a pretty evening; perfect temperature for outdoor dining. 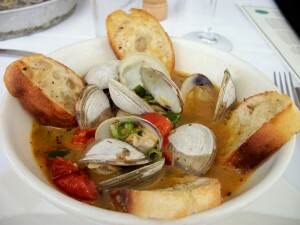 I had to order the Pan Roasted Clams, Zesty Chardonnay Butter Broth and Grilled Baguette. Again, they were delicious and the broth rich. 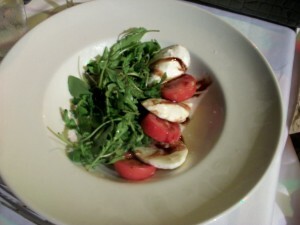 Another dish ordered was the Baby Arugula with Roma Tomatoes and Fresh Mozzarella, E.V.O.O. and Balsamic Syrup. Beautiful colors. 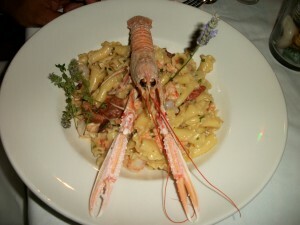 For dinner the Rock Shrimp and Langostino, sauteed with smoked tomatoes, tossed in a light chive cream sauce with garganelli pasta was ordered. I have to tell you that another was ordered with a request of the dish to be gluten free, and just like the first time, the Chef substituted rice for the pasta. 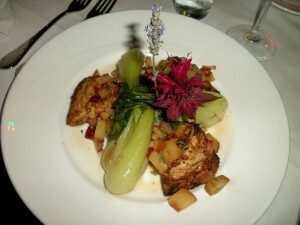 I ordered Thai Crusted Mahi Mahi, Ginger Plum Chutney, Bamboo Rice Pilaff, stir-fried baby Bok Choi. It had a nice bite to it. And, the last dish was a Grilled 8 oz. 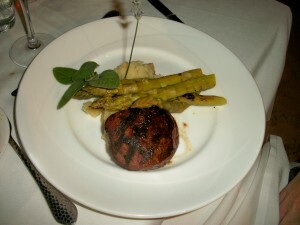 Tenderloin of Beef, Horseradish Mashed Potatoes and Grilled Asparagus. After all that food, no dessert was ordered. We enjoyed just a couple of coffees; nothing like sharing a meal with friends. It is priceless!! I want to mention the ladies that started a friendly chat. They were from Baltimore and it was so nice meeting them. Hope you have a good week-end. The weather has been great, don’t you think? Talk to you later…. Still, this is the best table in town. 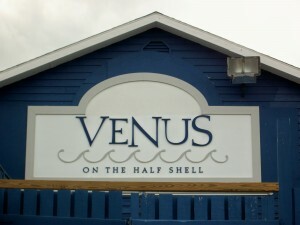 Comments Off on Venus On The Half Shell, Dewey Beach, Restaurant, Review, Delaware Beaches, Again?? There are so many things scheduled through the summer in Dewey Beach. It is a beach town that caters to young people. 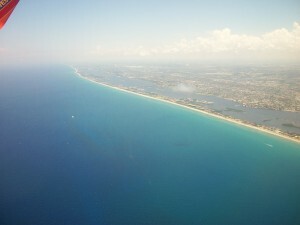 The beach, the water sports, restaurants, bars, and nightlife. 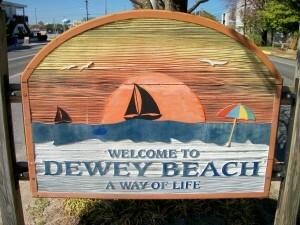 Yes, definitely, Dewey Beach is a Way of Life. Until Tuesday, July 6th – Dewey Beach Patrol Junior Lifeguard Program registration. The program starts on Tuesday, July 6th. It is for children ages 6 – 16. It is also a free program in conjunction with the U.S. Lifesaving Association. To sign up, please visit www.deweybeachpatrol.com and download the form. Monday, June 28th – Monday Night Movie – Shrek – Bring your chair, family and friends for a kid friendly movie on the beach, located at Dagsworthy St. and the Beach. 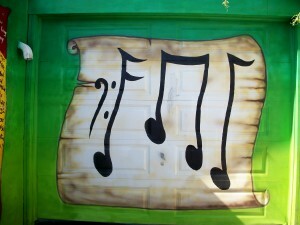 The show begins at 8:30 p.m.
Monday, June 28th – The Greaseband starts at the Cork. (No free tickets this year). 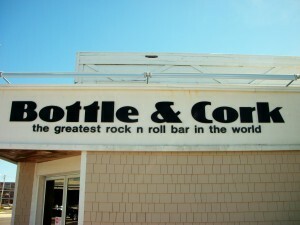 The Bottle & Cork is located on 18007 Rt. 1, Dewey Beach. You can also find them on Facebook. Tuesday, June 29th – Disney Hits Dewey on the Beach from 6:00 p.m. until 8:30 p.m. Radio Disney is a radio network devoted to children and youths, tweens and families. Youth will help pick music to be played and interact on a toll free line. Details? Call 1-800-441-1329 or visit www.radiodisney.com/Philadelphia. Wednesday, June 30th – Wednesday Bonfires. Bring beach chair, family and marshmallows for a Bonfire on the Beach at Dagsworthy Street and the Beach from 7:30 until 11:00 p.m. This is a Wednesdays event until August 25, 2010. Have a great time at the beach….talk to you later….. Many years ago, 1976, even before I considered living in Bethany Beach, I came to this town and right on Garfield Parkway there was a fairly young man, with his dog, and a small fire; it was fall. He was sculpting and his name was Peter Wolf Toth. I engaged him in conversation and he proceeded to tell me that he was donating the sculpting of the indigenous wood of the State of Delaware as a gift. The sculpture was to be known as Chief Little Owl and Peter Wolf Toth was paying honor to the Nanticoke Nation. He was working there for so long that residents would bring him food. Peter Wolf Toth was self taught and a humanitarian who wanted to give thanks to the United States. His journey was called “Trail of the Whispering Giants”. He created more than 50 sculptures of famous Indians and donated one to every state. Some larger states have more than one. His original sculpture, of Chief Little Owl, who welcomes everyone that visits Bethany Beach was weakened by termites and in 1992 it was destroyed by heavy winds. The remains are at the Nanticoke Indian Museum in Millsboro, Delaware. The second Totem Pole was done by Dennis Beach and this one lasted until 2000; rot forced the town to take it down. My picture is from the second one, taken on 8/31/94. Peter Wolf Toth, again, created the newest version from a red cedar log from the Pacific Northwest which should last 50-150 years. It was dedicated on 7/15/02. You cannot miss it. It is really a landmark in Bethany Beach. Bethany Beach Bandstand performances start at 7:30 p.m. unless otherwise noted. For updates please call 302-539-5484. Bandstand Schedule is on line: www.townofbethanybeach.com/activities/bandstand. Friday, June 25 is Keyboard America Piano Concert. Saturday, June 26th – The Crime Stoppers Music of Woodstock Remembered. This is a new event for 2010. Sunday, June 27th – the 2nd Annual Bethany Beach Firecracker 5K Fun Run/Walk. Pre-register at www.bethanybeach5k.wordpress.com. Race day registration is at 7:00 a.m. on the Bandstand. Race starts at 8:00 a.m. Please remember that this event is an official 4th of July Parade Fundraiser. Hopefully, all visitors can join. Sunday, June 27th – Chesapeake Brass Band at 7:30 p.m. Boardwalk Exercises: 7:30 a.m. – 8:30 a.m., Friday, Saturday, Monday. No Sunday Class. Drop in Fee. Thursdays to be determined. For info. call Christel at 302-542-8363. Yoga Summer Months on the Boardwalk & Bandstand – $5 fee. Friday, Saturday, Sunday from 6:00 a.m. – 7:00 a.m., also 4th of July and Labor Day. For more info. 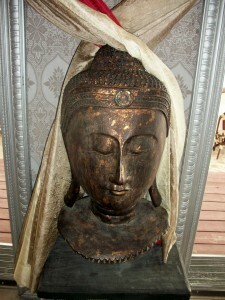 call 302-537-7838, or visit www.beth-anybeachyoga.org. Farmers’ Market – Summer Sundays until September 5, 2010. From 8:00 a.m. until Noon at the bank parking lot on the corner of Penn. Ave. and Garfield Parkway. Ride the Bethany Beach Trolley – If you are staying in Bethany this could be the easiest way to get around. Wave down the driver anywere along route for pickup, except on Rt. 26 or Rt. 1. No service on Jefferson Bridge Rd. Fare is 25 cents; exact change, please. Driver does not make change. The Trolley runs until September 12th. Daily from 9:30 a.m. until 10:00 p.m. Driver takes a break from 12:30 – 1:00 p.m. and from 7:00 – 7:30 p.m. More information needed? Then please call 302-539-8011. Or visit www.townofbethanybeach.com. Have a great week-end….kick back and relax…that’s why you are here. 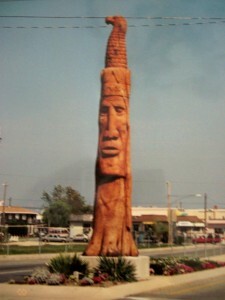 Note: Information on the totem pole was taken from www.townofbethany.com. Now that the summer has actually started all the beach towns are showing off what they can offer, not only for the visitors, but for all of us, locals and natives, as well. Thursday, June 24th – Cinema by the Canal at 211 Front Street, Lewes, presents Mama Mia at Dusk. Free to the public. Bring chairs, blankets, insect repellent. For more info. please visit www.rehobothfilm.com or call 302-645-9095. Saturday, June 26th and Sunday, June 27th – Celebrate the coastal arts with the Lewes Historical Society. The event? The Mid-Atlantic Sea Glass & Coastal Arts Festival. Sea glass, decoys and waterfowl art will be featured along with great food. The location is the Lewes Historial Society Complex right in historic Lewes. Saturday, 10:00 a.m. until 4:00 p.m. and on Sunday, 11:00 a.m. until 4:00 p.m. For more information please visit www.historiclewes.org. Sea glass: Found on beaches, along oceans, bays, rivers or large lakes, have been tumbled and smoothed by waves, water or sand, creating smooth, frosted shards of glass. Less common? Jade, amber, golden amber, lime green forest green, and soft blue. Rate and extremely rare? Grays, pinks, teal, black, yellow, turquoise, red. Orange is the least common; found once in 10,000 pieces. Saturday, June 26th – Sea Rats Atlantic – A group of historical re-enactors will relive the golden age of piracy in the early 1700’s with activities such as blacksmithing, and cooking at their encampment behid the Seaside Nature Center inside the Cape Helopen State Park, 10:00 a.m. until 4:00 p.m. For more information please visit www.destateparks.com or call 302-645-6852. Also, please remember that there is an entrance fee to the park. Until Saturday, June 26th – The Fantasticks at 8:00 p.m. at the Cape Henlopen High School Theatre, 1250 Kings Highway, Lewes. Tickets are $30 for reserved seatings, and $35 for preferred seatings. Seniors 65 and older and groups of 10 or more – $25. More info? Please visit www.infinitytheatrecompany.com/tickets or call 877-318-0071. On Sunday, June 27h the performances will be at 2:00 p.m. and 8:00 p.m. Explore Lewes with Rolf Photography (www.rolfephotography.com) on a Photo Walking tour. The Walk combines historic commentary of Lewes and helpful photo tips. It begins at 10:00 a.m. on Saturdays. Meet at Lewes Public library on the day of your reservation, 111 Adams Ave. Directions? Please visit http://www.leweslibrary.org/about/location/map.htm. The cost is $25 per person or $22 for friends members with current membership card. Cash or check only. For Photo Walk dates, questions and reservations please call 302-644-4458. Please note that disposable cameras, digital cameras, and film cameras are all welcomed. The walking tour is approximately 2 1/2 hours long and covers an area of less than a mile. Comfortable clothing, shoes, hat and sunscreen are recommended. 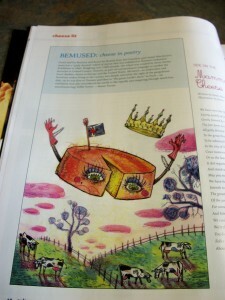 The illustrator can clarify complicated concepts or objects that are difficult to describe textually. They have been used in advertisement, greeting cards, posters, books, magazines and newspapers. I met James the other day. He is a traditional illustrator. Humor and imagination are an integral part to James’s style. He graduated from The University of the Arts in Philadelphia and is freelancing in the area. Hi website is http://www.jamestarnold.com and in it you will be able to find his illustrations, blog, bio, and prints. E-mail address is j.arnoldarnold@gmail.com and his tel. is 717-269-6588. 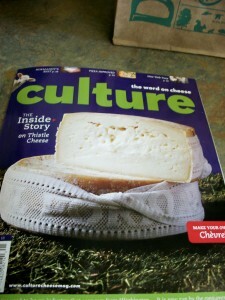 You will be able to see a sample of his work in the issue of The Word on Cheese Culture magazine.